J.E. Cosgriff Memorial Catholic School - EDUCATE IGNITE INSPIRE J.E. Cosgriff Memorial Catholic School, in Salt Lake City, Utah, is accredited for preschool through 8th grade by the Western Catholic Education Association. EDUCATE IGNITE INSPIRE J.E. Cosgriff Memorial Catholic School, in Salt Lake City, Utah, is accredited for preschool through 8th grade by the Western Catholic Education Association. THE MISSION of J.E. 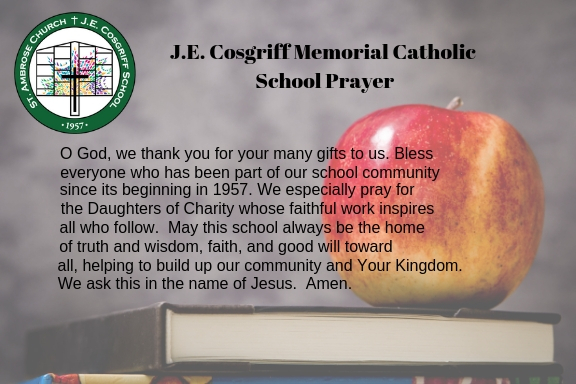 Cosgriff Memorial Catholic School is to guide our students to become respectful, responsible, and productive citizens through quality academic instruction that is grounded in Catholic teachings and tradition. grade by the Western Catholic Education Association.